Granddaddy and my cousin, Crystal. I took this photo when I was around 12 or so, with a new 35mm camera that he’d just bought me. His love of taking photos was the beginning of me taking snapshots of anything and everything in my life. I remember the last time I talked with my Granddaddy. He had gone into the hospital a few days prior, something my father explained to me as being “just a precaution.” My father’s father had emphysema, and was also going blind from macular degeneration. Funny that this would be the case, because my memory of the moment is from the point of view of someone who is going blind, herself. I see the crisp, white hospital room, the gangly teenager, the frail old man, all through a mist, like a cataract clouding my mind. I walked over to the hospital from my family’s upholstery shop after school one afternoon. My high school was 15 minutes’ drive from the town, so I’d driven in and parked the car in front of the shop, checked in with my father and dropped off my bookbag, then walked the couple of blocks over to Pungo District Hospital to keep Granddaddy company. I thought he must have been bored there, waiting for tests, taking a break to rest, whatever it is that people check into hospitals to do when they’re just a little too sick to stay home in bed. I had no concept of “sick.” I’d never missed a day of school, broken a bone, or been seriously injured. No one around me had ever been sick, other than Granddaddy, but he just seemed in need of a tune up, really. His room was private, and in a wing of the hospital that I’d never visited. It seemed pretty swanky, and at first the gloss and shine of the facility overpowered how odd it was to see him stretched out in bed in a hospital gown. When I walked in, he didn’t know it was me automatically. There was a bit of fear in his expression as he called “Who is it?” but I quickly introduced myself and saw the sweet smile I had expected brighten up his face. He sat up in bed and arranged himself proudly. This was a man who, just three months before, had driven me across town on the Fourth of July when my glasses broke and I couldn’t see to drive. Even in July, his eyesight had probably been worse than mine, but this aspect of the blindness seemed new, like he’d lost another layer of sight here in this unfamiliar place. I was shocked, but tried to keep my voice light and my face neutral, just in case. We talked about nothing, really. What were my college choices, what was happening in school, was I dating anyone, all of the little things a high school senior knows to talk about with her favorite grandparent. I asked if he was feeling well, and he told me that it was just a few tests, and he’d be out in no time. I took it at face value, and we continued to make small talk for a while longer. Eventually, though, it was time to let him get his rest. But first, a hug. He gave the best hugs. Granddaddy swung his legs out from under the covers. He was wearing gold toe socks, those soft cotton blend socks that my Nana washed with more care than any piece of her own lingerie. When I was a little girl, I’d sit with her while she repaired the heels and watched late night TV, the two of us drinking endless cups of coffee (mine with enough cream and sugar to kill a horse). Other times, she’d enlist me in making fun of him for wearing a pair where a toe or two would poke out. Complex relationships, seen from the eyes of the most devoted of young fans. Those socks were as much a part of him as the ugly ceramic dog face that held his glasses, the ever-present toothpick gracing the corner of his clever smile, or the cameras – always a camera in hand, always a smile or a pose expected. I was always happy to provide one. That was probably why I was able to hold my composure so well when I saw his legs. White and withered, with large veins and the knobbiest knees. They were just the legs of an old man, but there was more to it, somehow. My bold, bigger-than-life grandfather had shrunken. I gave him a hug, and we exchanged words of love. I told him I’d come back to see him soon, and he said he’d be out in the next day or two. He was always such a smooth talker. I held it together for a few seconds after I left his room. My uncle’s ex-wife was a nurse in the hospital, and though we weren’t on speaking terms, when she met me outside of his room and pulled me into an embrace, I didn’t fight it. The first sob was a primal thing, from depths I didn’t know existed. It felt like a black hole had opened up just under my heart, and was simultaneously sucking me into it and spitting out anguish and dismay. No one ever came out and told me that my Granddaddy, the light of my life, was dying. Not even he did. It was his knees that shared the secret. Shortly after, the family was informed that he had an advanced form of cancer, and had six months to live. He never left the hospital. He died two weeks later, the morning of my senior year Homecoming Game. We were together twice more before he passed away, but this is the memory that sticks with me. The next two visits were full of pain, Morphine, no smiles, no hugs, just fear and sadness. It’s probably fitting that the man who defined my childhood would also create the bridge that forced me, sharply and suddenly, into being a grown woman. 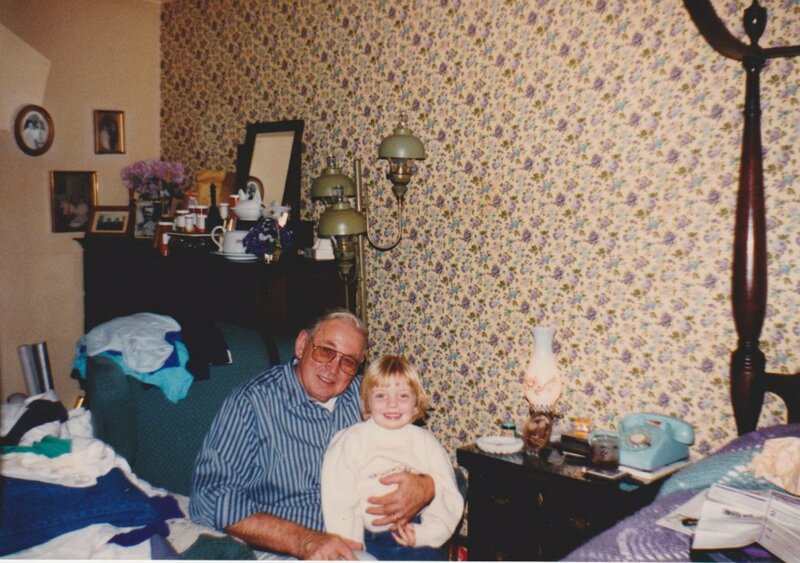 I miss you, Granddaddy…so very much. Wow, this is incredible powerful and incredibly sad. What a beautiful memory. Thank you for sharing. Thank you for sharing such an intimate time with your grandfather. I understand how it is the little things like shrunken legs and the sight of his knees that hold a powerful secret. Beautifully written. I am in tears. I’m touched. Thank you for leaving this note.